A festival for every taste: brass, jazz, classical and contemporary. Brass, jazz and three composers — American George Crumb, Cecilia McDowall of the United Kingdom, and Jean-Philippe Rameau of France — will be showcased this year at the UW-Madison School of Music in the form of five multi-day guest artist festivals, starting in October and continuing through March. Funding is provided by the Vilas Trust and Anonymous Fund at UW-Madison. We thank them for their support. Click links for details. October 8-13, 2014: Celebrate Brass! a festival of brass-related concerts, masterclasses, and open rehearsals, featuring internationally acclaimed Norwegian tubist Oystein Baadsvik, hornist alumna Jessica Valeri of the San Francisco Symphony Orchestra, the Western Michigan Brass Quintet, the Wisconsin Brass Quintet, composer Tony Plog, and musicians and alumni of the UW-Madison School of Music. December 4-6, 2014: The 4th Annual UW-Madison / Madison Metropolitan School District Jazz Festival featuring New York jazz trumpeter Ingrid Jensen. 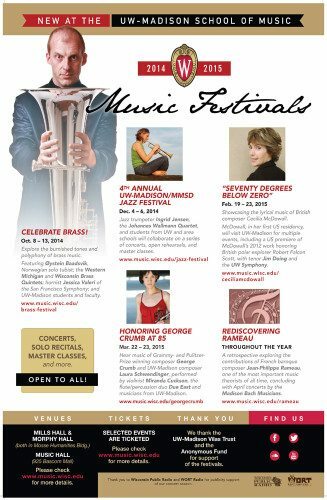 Offering master classes and concerts for college and high school students, with a final festival concert on Dec. 6. Juno-award winner Jensen is artist-in-residence at the University of Michigan and part-time faculty member at the Peabody Conservatory. This marks the first time the festival will be held at the UW-Madison School of Music and will feature musicians and alumni of the UW-Madison School of Music. February 19-23, 2015: “Seventy Degrees Below Zero”- Presenting the music of British composer Cecilia McDowall. A festival of rehearsals, masterclasses, colloquia, and concerts highlighting the works of British composer Cecilia McDowall (in residency) including her compelling composition based on Robert Falcon Scott’s last letters home from the Antarctic, scored for tenor voice and chamber orchestra. Featuring musicians and alumni of the UW-Madison School of Music as well as a special multi-media presentation by UW-Madison Antarctic scientist Michael Duvernois. March 22-23, 2015: Honoring George Crumb at 85 A festival of workshops and concerts featuring contemporary composers, including George Crumb, in honor of his 86th birthday. Guest performers will include Nunc, an ensemble featuring award-winning violinist Miranda Cuckson, and Due East, a flute and percussion duo. Featuring musicians and alumni of the UW-Madison School of Music. Yearlong: “Rediscovering Rameau” A year-long festival marking the 250th anniversary of the death of French Baroque composer Jean-Philippe Rameau, one of the music important music theorists of all time. The UW-Madison and community partners will offer a series of free public events beginning this fall and culminating in April with two ticketed concert performances of Rameau’s one-act opera, Pygmalion, by the Madison Bach Musicians. More information soon! Concerned about where to park? It’s not as difficult as you think. Click here for information. Click this link to hear more performances.